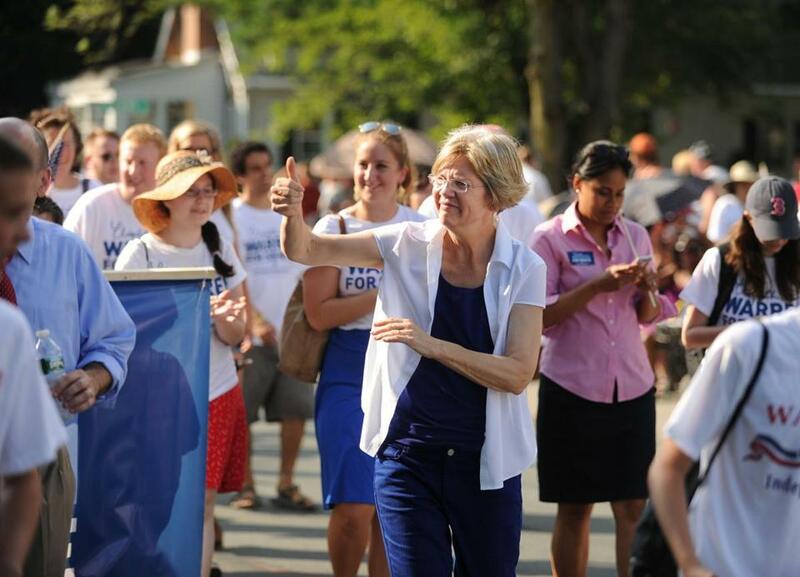 Elizabeth Warren greeted spectators during the Wakefield Fourth of July Parade. 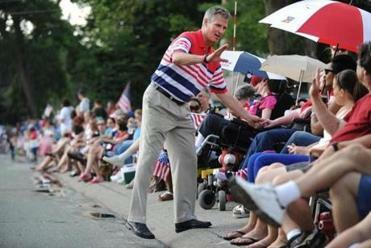 Sen. Scott Brown also greeted spectators during the Wakefield parade. As the fiercely contested race for Senate rolls into its final month, mayors and other prominent political figures in cities and towns around Boston are weighing in on which candidates they favor. When it comes to landing the backing of the region’s mayors, at least, Warren had the clear edge as of last week. In an informal Globe survey, 12 of the 25 mayors said they are supporting Warren, with Vigeant the sole Brown supporter. Seven other mayors had not endorsed either candidate, while the views of five could not be learned. But across Eastern Massachusetts, both candidates have their share of well-known backers, some fervent. Both Senator Scott Brown and challenger Elizabeth Warren are leaning on networks of artists, photographers, and writers for support and fund-raising. Among those taking sides are the region’s top Democratic and Republican legislative leaders. House Speaker Robert A. DeLeo, a Winthrop Democrat who also represents Revere, said in a statement that he is supporting Warren. “She, along with the rest of the Democratic ticket, cares about creating jobs and strengthening our economy. She has spent her career fighting to help struggling families and she is committed to working for my neighbors in Winthrop and Revere,” he said. Among the mayors backing Warren, many cited what they said was the Harvard Law School professor’s willingness to champion the needs of the middle class. “I believe that Elizabeth Warren is a person who will really fight for the average person,” said Newburyport Mayor Donna D. Holaday, a Democrat. Also appealing to Warren’s mayoral supporters is her support for public investments, including in cities and towns. Across Eastern Massachusetts, both candidates have their share of well-known backers, some fervent. Among those taking sides are the region’s top Democratic and Republican legislative leaders. Some of the mayors also cited the importance of electing a Democrat to the seat. Brown’s supporters, including some Democrats, say he brings the moderate views and compromising style needed in Washington. Hall said those qualities, coupled with what he views as Brown’s moderate positions and that “Scott called me personally and asked for my endorsement” were reasons he decided to back him. Holaday, Newburyport’s mayor, questions the image of Brown as a moderate. However, Brown’s campaign has highlighted his endorsements from Democrats as evidence of his record of reaching across the partisan divide. 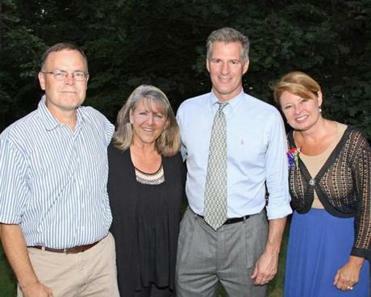 In addition to Casey and Hall, Brown’s Democratic backers include state Representative Christopher C. Fallon of Malden; former Lowell mayor Rita Mercier; and former state representatives Bob Ambler of Weymouth, Robert Durand of Marlborough, Anthony Verga of Gloucester, and Arthur Broadhurst and Larry Giordano, both of Methuen. Other Democrats for Brown include a former Bristol district attorney, Paul Walsh, and city councilors Rick Caraviello of Medford, and Joe Giordano of Waltham. “More and more Democrats are crossing the aisle to endorse Brown because he is an independent problem solver who can work across party lines to get things done,” Brown’s press secretary, Alleigh Marré, said by e-mail. Warren, meanwhile, has the support of the region’s two mayors without a party affiliation, William F. Scanlon Jr. of Beverly, and Patrick Murphy of Lowell. “I think Elizabeth Warren is much better equipped to do the job,” Scanlon said. Murphy said he believes Warren “will do a great job in the Senate,” citing her advocacy for creation of the new Consumer Financial Protection Bureau. Other area mayors supporting Warren are Kimberley L. Driscoll of Salem; James J. Fiorentini of Haverhill; Gary Christenson of Malden; Thatcher W. Kezer III of Amesbury; Michael J. McGlynn of Medford; and Stephen N. Zanni of Methuen. Quincy Mayor Thomas P. Koch, a Democrat, is among mayors who have not taken a position in the race. “He is elected on a nonpartisan basis as mayor. He has worked very well with Senator Brown’s office and he has great respect for professor Warren. So he intends to work with the US senator who represents Quincy regardless of the election outcome,” said Christopher Walker, the city’s director of policy. Mayors Ted Bettencourt of Peabody; Carlo DeMaria Jr. of Everett; Scott D. Galvin of Woburn; Carolyn Kirk of Gloucester; and Daniel Rizzo of Revere, all Democrats, and Judith Flanagan Kennedy, a Lynn Republican, also have not endorsed a candidate. The positions of mayors Linda M. Balzotti of Brockton; Susan M. Kay of Weymouth; William Lantigua of Lawrence; Jeannette A. McCarthy of Waltham; and Joseph C. Sullivan of Braintree could not be learned.